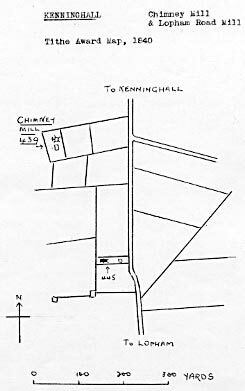 Kenninghall Lopham Road smockmill stood on the west side of the North Lopham Road, which was further south than the Chimney_postmill on the same road. In 1828 the mill was using a single pair of patent sails, possiblly in addition to an original pair of common sails to drive 2 pairs of French burr stones. Mr. Brook's mill set up in Kenninghall June 13th 1823. Brook's mill Kenninghall repaired April 1828. 2 patent sails set to work at Mr. Brook's mill at Kenninghall about Diss Fair November 1928. It was later reported that the mill was using two older, common sails in adddition to the pair of new patent sails. Using the power of canvas comon sails with the control of the shutters of patent sails was quite a popular system used by some older Norfolk millers. Mill shown on the map as a smockmill or a small towermill. A TOWER MILL with a MESSUAGE, Outbuildings & about 4 Acres of Land adjoining, in the occupation of Mr. John Brame. For further particulars apply to Mr. F. Fowell, Jr., Solicitor, Blo Norton, Harling, Norfolk. A TOWER WINDMILL with a substantial Brick & Tiled Messuage, Outbuildings& three acres & a half of excellent Land adjoining abutting upon the Road leading from Kenninghall to North Lopham, in the occupation of Mr. Samuel Herring. Further particulars in future papers & in the meantime of Messrs. Fowell & Son, Solicitors, Blo Norton, Harling. A TOWER WINDMILL with substantial Brick & Tiled Messuage, Outbuildings& about 3½ Acres of excellent Land adjoining abutting upon the Road leading from Kenninghall to North Lopham, in the occupation of Mr. Samuel Herring. Further particulars apply to Messrs. Fowell & Son, Solicitors, Blo Norton, Harling or to the Auctioneers, Thelton, Thrandeston & Diss. A TOWER MILL driving two pairs French Stones, with MESSUAGE, Outbuildings & about 3½ Acres of excellent Land adjoining, in the occupation of Mr. Samuel Herring. For further particulars apply to Messrs. Fowell & Son, Solicitors, Blo Norton, Harling, Norfolk. North Lopham mill in occupation of W. Womack completely wrecked. At Kenninghall Heath ... The southern one, a post, belonged to Robert Womack; who had it demolished. Site at Townlands Farm. His father, Bertram Gillings used to farm there as tenant of Trustees of Kenninghall Townlands Charities, the owners.